Marketed as “the hitch rack with a higher purpose,” the Saris T-Bones is a dual-function car rack and bike stand. A quick transition with the flip of a lever frees the rack from a mount on your car’s trailer hitch to convert it to a streamlined rack stand for use in a garage, office or apartment living room. 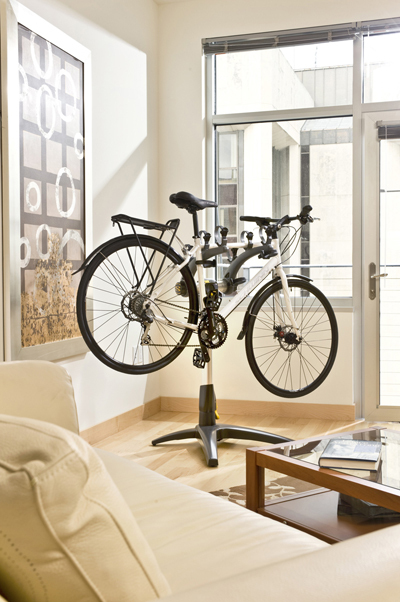 Inside your house or apartment, the rack docks to a four-footed stand, creating a convenient and space-saving place to put your bikes. The Saris Cycling Group (www.saris.com) made T-Bones for urban dwellers or people who want to bring their bike to the office. 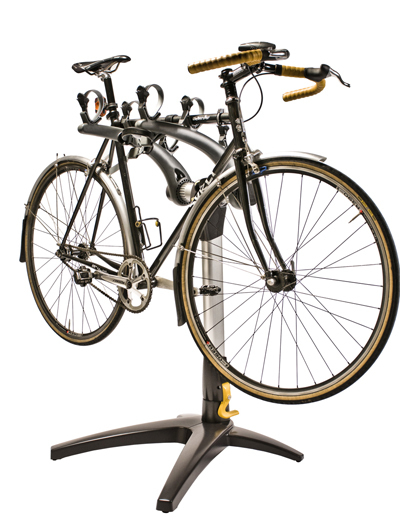 The stand saves space and is a nice way to organize one to three bikes without simply leaning them against a wall. In my test, the T-Bones system worked well. It was easy to set up on my car, as the rack fits both 1-1/4” and 2” hitches. The company sells a two-bike version and a three-bike version; both are made to handle a weight limit of up to 35 pounds per bike. Saris’ ratcheting straps lock bike frames solidly on, and the arms tilt up and down for a good fit on the back of most cars. Your bikes can be locked to the rack with an integrated cable. Just pull it out and loop it around your bike frames to lock it up. Below, on the hitch, a locking hitch pin fastens the T-Bones to your car. Both the rack lock and the hitch pin lock work on the same key. It’s a slick setup. 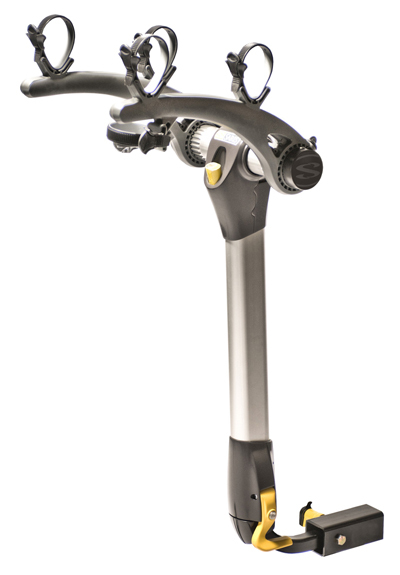 But you do pay a premium for the rack’s double-duty build: The Saris T-Bones system costs $349.99 for the two-bike rack and $379.99 for the three-bike rack. Compared to premium hitch racks like the Thule 970 Helium, which costs $379.99 for a three-bike model, the Saris is a comparable cost. But you can find hitch racks for much less, including the likes of Yakima’s Doubledown 2 ($199) and Thule’s Parkway hitch racks, which start at $149. From Saris, a different model, the T-Rax hitch rack, is $189.99. The T-Bones weighs about 10 pounds when detached, making it an easy haul from the car to your house for use as a rack-stand. I kept my Saris stand in the garage, moving the rack back and forth with little effort. The rack was solid on my car, and in the garage it made for a nice place to stack two bikes in a corner — stable, secure, and out of the way.